Quiet and frugal. 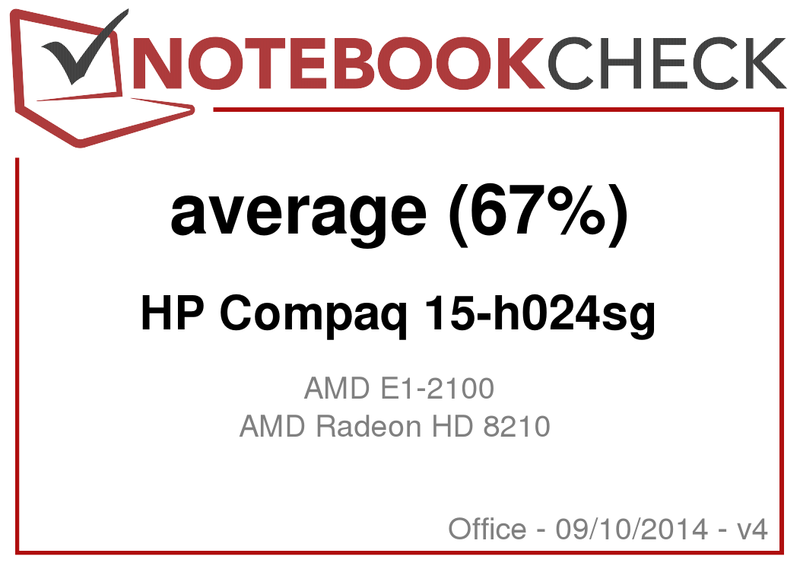 HP only charges around 260 Euros (~$358) for the Compaq 15-h024sg. For this price you get a simple 15.6-inch notebook with a frugal AMD APU and a 500 GB hard drive. The Windows operating system is not provided. Our review shows if the notebook can still convince us despite the low price. Many notebook manufacturers continue to sell simple office notebooks with retail prices well below 300 Euros (~$413) to attract the attention of customers. You should not expect too much for this amount of money, but there are still some devices with a great price-performance ratio among these very inexpensive notebooks. Is the HP Compaq 15-h024sg such a device? We use the rivals Acer Aspire E1-532 (Celeron 2955U, HD Graphics (Haswell)) and Asus F550CA-XX078D (Pentium 2117U, HD Graphics (Ivy Bridge)) to classify the notebook. The whole case is made of plastic (picture: HP). Black display cover (picture: HP). 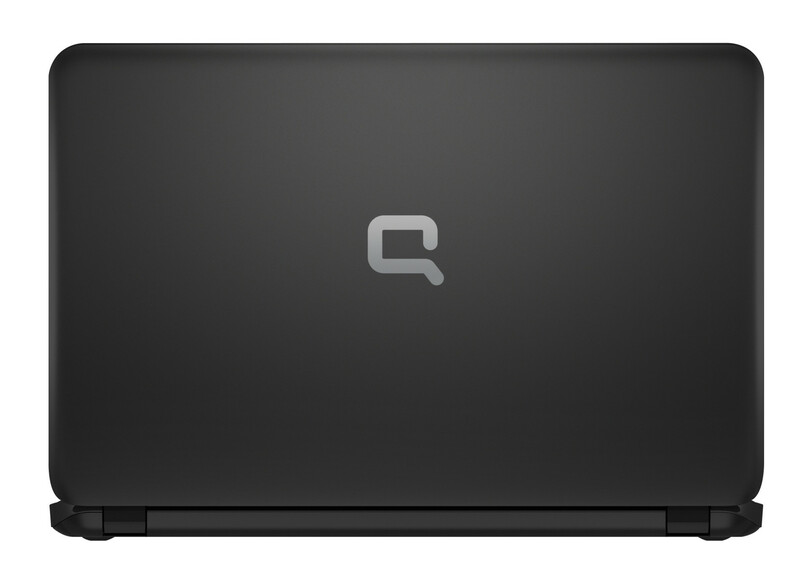 The case of the Compaq 15 is completely made of plastic, but we did not expect anything else at this price. The basic shape of the device is similar to the notebooks from the Pavilion 15-series like the Pavilion 15-n050sg or Pavilion 15-n005sg, but the dimensions are slightly different. A lot of the case is made of black, matte roughened plastic. The top of the base unit has a glossy silver surface and the overall case leaves a decent impression. There are sometimes problems with uneven gaps and there is no maintenance cover. The battery is at the back and can be removed. The Compaq is not up to date anymore in terms of connectivity. You get 3 USB ports, but none of them support the USB 3.0 standard. HP also waived the VGA port and there is no Gigabit Ethernet, only a Fast Ethernet port. Both the Aspire as well as the F550CA show how it should be: They have Gigabit Ethernet as well as one VGA and USB 3.0 port each. There were no problems with the WLAN module: The connection was stable within a 15 m radius around the router. The operating system of the HP notebook is FreeDOS, but the installation of Windows 7 or 8.1, respectively, should not be a problem. HP provides drivers for both operating systems. Card reader at the front. HP equips the Compaq with a non-illuminated chiclet keyboard. All keys are flat and slightly roughened. Overall they have a limited travel and a clear pressure point, but the feedback could be a tad firmer. The keyboard also bounces a bit in the area of the numeric keypad during typing. The touchpad supports multitouch gestures and is 11 x 5.4 cm, which is large enough for several multitouch gestures. The pad has a roughened surface that does not affect the gliding capabilities. Both mouse buttons have a clearly audible and perceptible pressure point as well as a short travel. 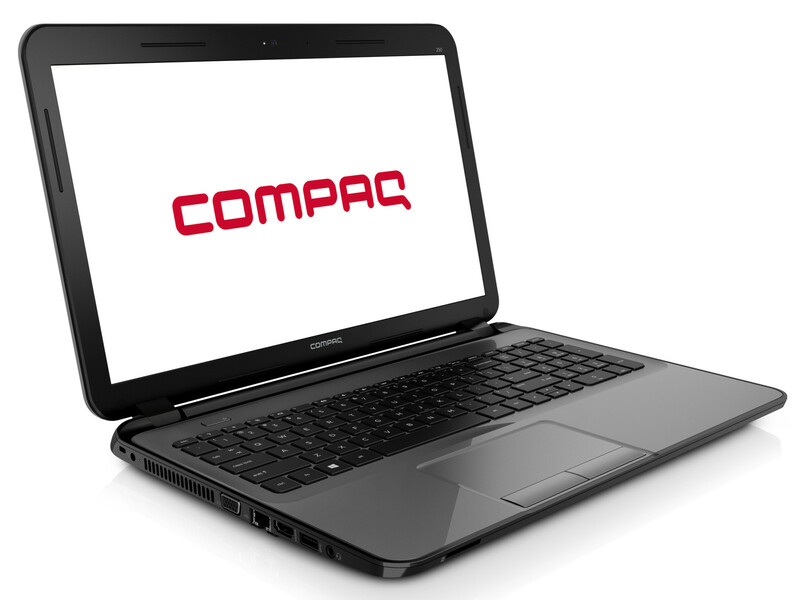 The Compaq has a glossy 15.6-inch display with a resolution of 1366x768 pixels. It only has an average brightness of 199.6 cd/m², but a good contrast ratio of 846:1 and a good black value of 0.24 cd/m² in return. We determined similar results for the F550CA; the Aspire cannot keep up with the rivals in regard to the contrast. The average DeltaE-2000 deviation of the display is better than the majority of reviewed displays with a value of 8.03. However, none of the colors meets the target area (DeltaE smaller than 3). Unfortunately there is a visible blue cast, but it can be corrected with a display calibration. We tried it. You can actually use the Compaq outdoors, but you should avoid too bright environments and you have to adjust the display position to prevent reflections. The viewing angle stability does not hold any surprises and meets the price of the notebook: The picture quickly starts to invert with vertical shifts, but the situation is better with horizontal changes. You can still see the picture content from the side but the picture gets noticeably darker with an increasing angle. HP's Compaq 15-h024sg is a simple office notebook in a 15.6-inch form factor. The notebook is sufficient for simple tasks like web browsing, Skype, typing or watching videos. The price of the laptop is 260 Euros (~$358) and the version with Windows 8.1 (Compaq 15-h023sg) is available for around 350 Euros (~$482). 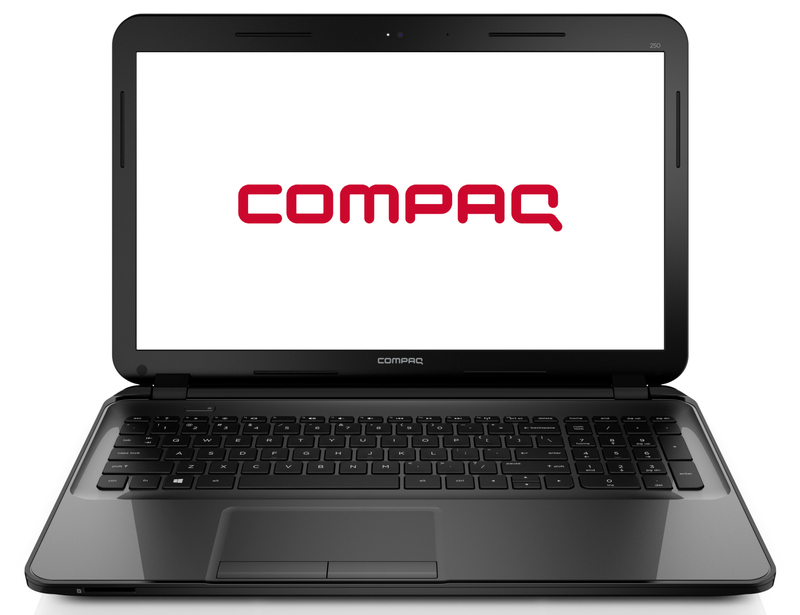 HP offers numerous versions of the Compaq 15, both with Intel processors as well as AMD APUs. HP equips the Compaq with an E1-2100 APU from AMD's current Kabini generation. The CPU part of the APU consists of a dual-core processor clocked at 1 GHz. There is no Turbo, but the TDP is very frugal with just 8 Watts. It is therefore not surprising that the CPU can maintain its maximum clock in the Cinebench CPU benchmarks. The Compaq cannot keep up with the F550CA or the Aspire. Their Intel processors are far superior compared to the AMD APU in single-thread as well as multi-thread applications. You definitely notice the slow APU inside the Compaq in practice. It occasionally stutters when you switch between windows and opening a folder can also take some time, but overall it is fine as long as you do not bring it to its limits. It is not surprising that the PCMark 7 result is not overwhelming, and the Compaq falls behind the competition in this test as well. HP uses a hard drive from Toshiba for the Compaq. It has a capacity of 500 GB and works with 5,400 revolutions per minute. Overall the results are decent for a 5,400 rpm drive and they are comparable to similarly equipped rivals. Graphics are handled by the Radeon HD 8210 GPU, which runs with 300 MHz and supports DirectX 11.1. Similar to the Cinebench benchmarks, once again the Compaq cannot keep up with the Aspire or F550CA in the 3DMarks. The only exception is 3DMark 2011 where the Compaq is on a level with the F550CA. The reason for this is that the CPU does not have a very large impact on the result. The Compaq has the weakest CPU within the competition, so it falls behind in the other benchmarks. Neither of the two devices can keep up with the Aspire, which has the most powerful GPU. This is not the right device if you are looking for a gaming notebook. The Compaq can only manage a few games with a smooth frame rate in low resolutions and with low details, but the two rivals are not much faster, either. A notebook that is powerful enough for gaming costs at least 400 to 500 Euros (~$551 to ~$688). A recommendable model would be the Aspire E1-572G (Core i5-4200U, Radeon HD 8750M). It is structurally identical to the Aspire E1-532 and retails for around 450 Euros (~$619) without Windows. The fan does not have to work really hard because of the frugal APU inside the Compaq. It always runs at a low speed and is hardly audible. Both the Aspire and the F550CA are similarly quiet. All three comparison devices have frugal CPUs or APUs respectively. The notebooks do not produce a lot of heat in any scenario and hardly get warm. We cannot measure values above 40 °C at any spot under load. Our stress test (Prime95 and FurMark for at least one hour) shows the full performance for the CPU and GPU, both with AC power and on battery (CPU: 1 GHz, GPU: 300 MHz). The CPU temperature leveled off at around 47 °C during the stress test. (+) In idle usage, the average temperature for the upper side is 26.6 °C / 80 F, compared to the device average of 29.4 °C / 85 F.
(-) The average temperature of the palmrest area of similar devices was 28.2 °C / 82.8 F (-3.8 °C / -6.8 F). The stereo speakers of the notebook are at the front of the bottom. They produce a tinny sound that lacks bass, but voices are easy to understand. We recommend external speakers or headphones for a better sound experience. The TDP of the AMD APU (8 Watts) is much lower compared to the two Intel processors (15 and 17 Watts), which means the Compaq is more frugal than the competition under load. Maximum load only results in a consumption of 15.2 Watts, but all three devices are comparable during idle. Our practical WLAN test uses a script that refreshes websites every 40 seconds while the energy-saving mode is active and the display brightness is adjusted to around 150 cd/m². The Compaq manages a runtime of 4:46 hours, which is okay for such an inexpensive and frugal notebook. The Aspire (4:30 h) only falls behind by a couple of minutes, but the F550CA (3:26 h) has to be recharged much earlier. HP offers a simple 15.6-inch notebook for a very low price with the Compaq 15-h024sg. Occasional web browsing and text editing is no problem for the device and it is even powerful enough for movie playback. It is very quiet all the time, does not consume a lot of power and manages good battery runtimes. Surprisingly, you also get a decent display. It has a good contrast with average brightness results. We also reviewed comparable notebooks with worse displays. The biggest problem of the notebook is, however, the integrated APU: It is just not very powerful. Acer proves that you can expect more from a device below 300 Euros (~$413): The Celeron processor inside the Aspire E1-532 is much faster than the AMD APU and results in a more balanced system experience. The lack of a USB 3.0 port is another drawback of the Compaq, and Acer once again shows that the price range allows USB 3.0. 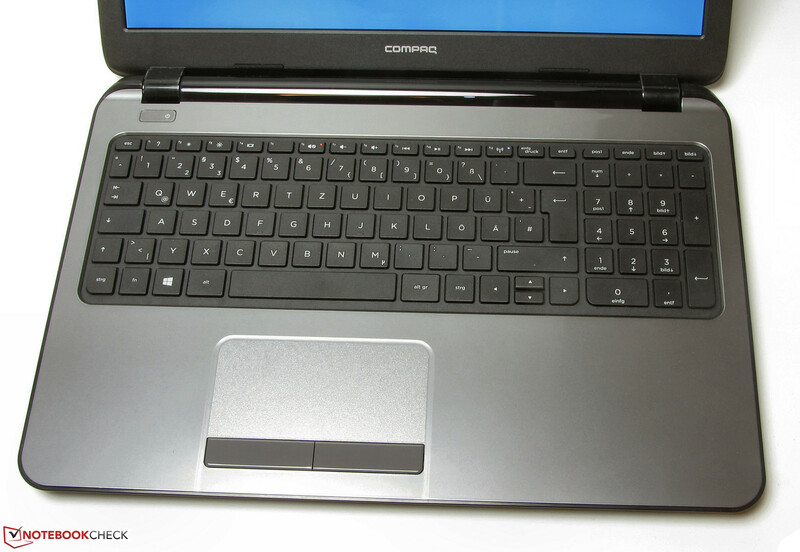 The Aspire also has a matte display and a better keyboard. Last but not least: Acer grants a two-year warranty, while users of the Compaq only get 12 months. Overall, the Acer is a much better device. Asus' F550CA-XX078D offers the highest CPU performance within the competition. It is, however, significantly more expensive than the Aspire and the Compaq with a current retail price of around 320 Euros (~$440). By the way, none of the three devices come with Windows. The almost silent operation and the low power consumption. A more powerful APU or a faster processor respectively. We also miss USB 3.0 – at least one according port should be standard for every notebook nowadays. The display is actually quite decent despite the low price. Acer Aspire E1-532, Asus F550CA-XX078H, Toshiba Satellite C50-A-1JU, Lenovo IdeaPad Flex 15, Toshiba Satellite C50D-A-10E, Asus F55A/X55A, HP Pavilion 15-n050sg, HP Pavilion 15-n005sg, Lenovo G505s, Lenovo G500, Acer Aspire E1-522, Acer Aspire E1-572, Samsung ATIV Book 2 - 270E5E, Wortmann Terra Mobile 1512.